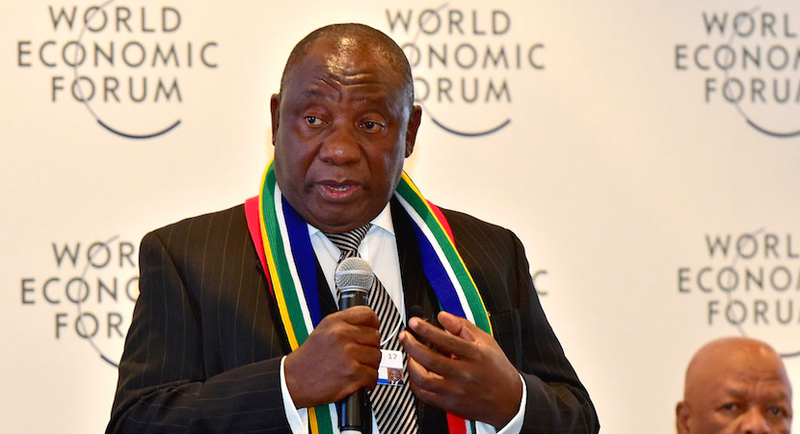 Deputy President Cyril Ramaphosa will lead the South African delegation to the 48th World Economic Forum annual meeting that will take place on 23-26 January in Davos-Klosters, Switzerland. The meeting will take place under the theme; “Creating a Shared Future in a Fractured World”, and will promote renewed commitment to international collaboration as a way of solving critical global challenges. Cyril Ramaphosa addresses the Business Interaction Group on South Africa at the 2017 World Economic Forum in Davos, Switzerland. The meeting will bring together over 2500 leaders from business, government, international organisations, civil society, academia and the arts. The Deputy President led the delegation to the 2017 Davos meeting as well. The South African delegation will comprise Ministers and business leaders, with the Minister of Finance, Mr Malusi Gigaba as the lead Minister and coordinator. President Jacob Zuma has wished the delegation well in the annual meeting which provides an important platform to market and showcase the country to global business and other key international stakeholders. President Zuma will lead the country’s delegation to the 30th African Union Summit in Addis Ababa, scheduled to take place from 22-29 January 2018., with the President attending the African Peer Review Mechanism/NEPAD sessions on 27 January and the 30th Ordinary Session of the Assembly of the Heads of State and Government of the African Union scheduled to take place 28-29 January 2018.